So, here we are at the end of November with no century ridden. We have no real excuse except the regular excuses - family, jobs, etc. Too bad, since we missed a few really nice riding days. No, seriously, it's been in the 70's and sunny here in the Dallas area, as opposed to being snowed in like other parts of the country. Anyway, we are skipping this month and will have to do a make up ride later on. We'll probably be more motivated in the spring when there are more organized rides. Once we pay a fee and get a t-shirt, we feel obligated to ride. Here it is, Nov 1, and we don't have a solid plan for this month's century. Or next month, for that matter. Or anything until about May of 2011. The best idea so far is to do a loop around DFW. It won't be an "official" ride, but it may have to do. I rode in to work the other day. Usually my bike commutes are uneventful, even here in Dallas (which is not generally recognized as a bike friendly city). Once in awhile I get a honk, but the number of cars that go by without incident far out number the ones that cause trouble. First, I met a fellow bike commuter who is a member of the Lone Star Randonneurs who was testing out his rig before an upcoming 300k event this Labor Day. He said he opted for the 300k route instead of the 600k route so he wouldn't be too worn out for his upcoming 1200k route in Colorado. There are people who love cycling, and then there are people who love cycling. We chatted for a mile or so at 20mph before he took off like he was shot out of a cannon. Then I lost my temper. On an essentially residential street, one wide lane in each direction, I came up to a intersection with a stop sign. At the intersection there was a short lane marker for those turning left vs those going straight/right. I pulled in to the left hand turn lane as required by law. An SUV pulled up behind me, and the ignorant-of-the-law driver said "get on the sidewalk!". I said, "you first!" and proceeded in to the turn. Normally, I ignore and blow off idiots like this. They aren't worth my time, and not worth breaking my zen-like riding state. But this one got to me. Maybe it was because as I made the left turn and took the right most lane, I knew the car would pass me on the left. And as the car came up, I could see the passenger side window rolled down and I knew what was coming next. I opted for a preemptive strike and yelled in no uncertain terms that the driver and passenger should learn the law. There might have been some descriptive terms about their intelligence after that. I'm not proud of that, and it was not the best way to handle the situation. I've decided that the best way to handle the situation is to take a picture of the car with both the driver and the license plate in view and submit it to the proper authorities. I think a cheap disposable water proof camera (do they still make those?) would look great hanging from my handle bars. I am no longer riding my bicycle. I am driving it. "Riding a bike" is what kids do. "Driving a bicycle" is what serious adults do to get to work and back. I have a wife and a dog and a mortgage and potential future children and I choose to drive my bike to work to maintain my sanity and my health and I will command the respect that any other commuter is entitled to. 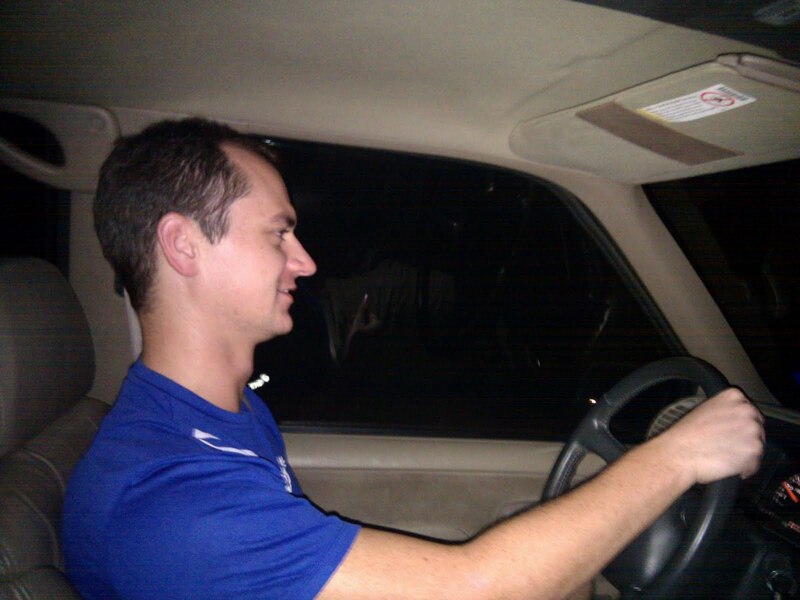 On the way home, a driver pulled up in the lane next to me with his window rolled down. After the morning's incident I was expecting trouble but he surprised my by asking if I knew where a hotel was (unfortunately I didn't). Just goes to show that not all encounters with cars are bad. A 99¢ loaf of white bread can go a long way! Carbs carbs carbs and a little coffee on the side. Okay, a lot of coffee. 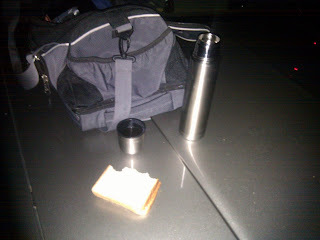 We camped in a field labeled as 'tailgate parking' which is pretty dark and reasonably quiet. Better than we hoped for. My eyes popped open at 4:20, only a little earlier than our planned 5AM wake up. Jon is still snoring away. We're on the road to our second 100 miler. Jon's at the wheel and I'm making the PB&J's. Weather reports look to be good, low wind and highs in the low 90s. Road laws are meant to keep everyone, motorized and not, safe. Some cities are trying to pass laws that ban legal cycling activities on our public roads. When a cities create traffic rules that are different from state law it creates confusion and a dangerous situation for motorists and cyclists alike. Check out the links on the right to support cycling activities all over. Ride DART -- or ride your bike! DART has a new commercial out promoting their buses and commuter rails. This is a great first step to greener commuting, but where are the commercials for riding your bike to work? Or riding your bike to a DART station? At least some of the buses are equipped with bike racks. 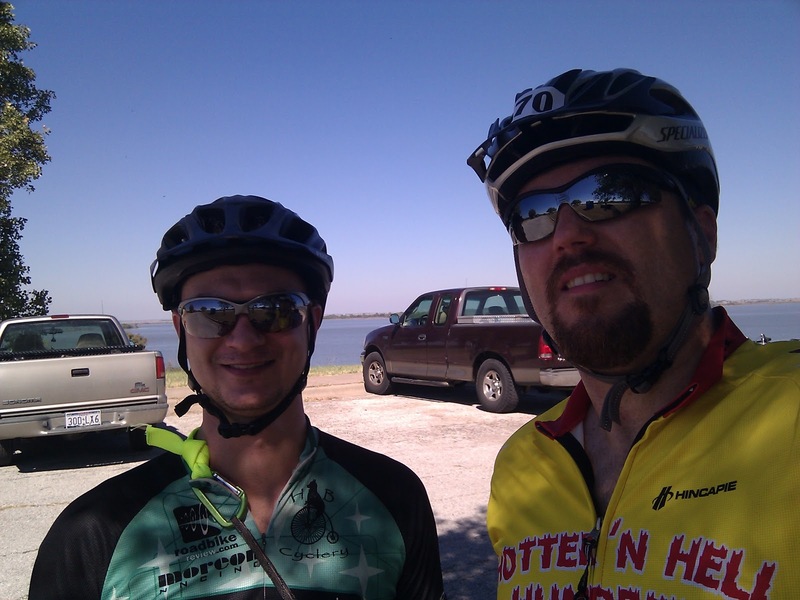 30 mile training ride today, which we covered in less than 2 hours including stop lights and the "hills" of north Dallas. Good ride, could have gone longer but other obligations called. The really good news is that the temperatures are starting to fall off - it was actually decent by the time we got back (and by decent I mean less than 90*F). So, we liked the idea of supporting cancer research and the date fit. But then, donations actually started coming in from friends and family... and along with them have come the stories about those who have survived cancer as well as those who have not. I have been humbled by the responses. So what started as a personal endeavor has now taken on a larger meaning and we will do our best to make our supporters proud. Help us fight the good fight. While some students may be doing this for the "boobie" factor, many are wearing them for legitimate reasons and know someone who has been affected by breast cancer. What do you think? Should this be allowed or is it too much of a distraction in a school? Next Up: Tour de Pink! Our next epic ride will be the Tour de Pink to ride in support of breast cancer awareness and research. We are raising donations to contribute to the cause and any support you can give is truly appreciated. Our personal donation pages are listed below. We've got a bet going as to who can raise the most money before the ride - the person with the least donations has to be the domestique! So help us out and click below to donate. The Hotter N Hell is getting more crowded every year. I remember the first year I rode it the mass start took forever to get through the starting line, but then after 50 miles or so I'd be on a stretch of road with dozens or hundreds of meters between me and the next cyclist. Now, they've switched to wave starts (which really helps), but there was not one moment when we were by ourselves on the road. The total participation has gone up by a few thousand, so maybe it is just that or maybe a greater percentage of people are riding the century. We made great time the first couple dozen miles and probably we went out too fast. I had to catch up to Dan to tell him we wouldn't be able to sprint through the crowd because the crowd would never end. 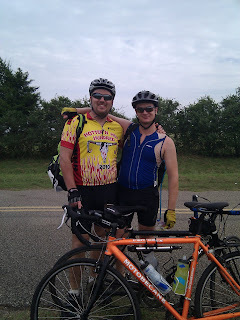 At about 16 miles we came to a complete stop in a traffic jam of shoulder to shoulder riders. Someone ahead had wrecked bad, and between the gawking and the slowing the traffic jam was as bad as on any car dominated freeway. Is this the future of cycling? When everybody does it, will it just be another congested roadway with people dripping sweat instead of belching car exhaust? In any case, we got through. Some members of our family weren't so lucky - they were stuck for half an hour while cyclists were cleared off a section of road and no one was allowed to proceed until the Careflight helicopter had landed and retrieved the downed cyclist. We didn't stop again until mile 50 when we reloaded our camelbaks and grabbed some snacks. Well, that's not entirely true - we took a brief hop off the bike when the group was stopped by a train crossing the road. After the mile 50 stop we planned to keep on truckin' until we hit Hell's Gate. That almost worked. Jason, Dan, and Jon at a rest stop yet still baking under the sun. Does wearing the ride jersey at the ride make you a dork? Does wearing a sleeveless triathlon jersey make you a tool, even if you trim up so it doesn't look like you have a squirrel in a headlock? Just before we got to Hell's Gate, Dan got a flat. We pulled off safely to the side of the road and took a look. Upon pulling off the tire, we found the hole and saw that on the inside of the tire there was a worn section where the wires were starting to show through. Very strange. We cut a section of the old tube to prevent the new tube from blowing out as well and got it aired up again. 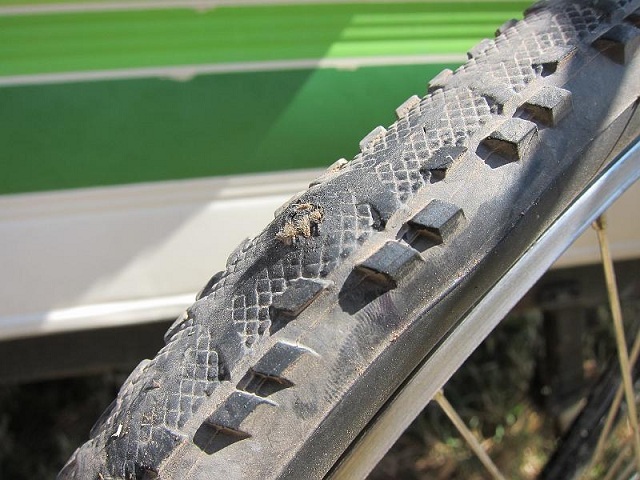 With the wheel mounted again, we noticed something malignant - there was actually a bubble forming on the tire itself! It looked like a cancerous zit forming in the middle of the tire, angry and swollen and threatening a blowout of the tire. We crossed our fingers and rode on, hoping it would hold up for the next 40 miles. If you don't reach the Gate in time, you either have to SAG it in or take a shorter route back home. 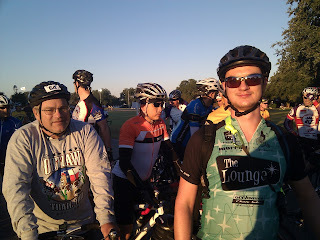 Our fast pace paid off and even with the flat and the rest stop we sailed through the Gate and on to the rest of the 100 mile route. Dan, Jon, and Jason at Hell's Gate. Towing enforced, apparently. By this time we were starting to feel the fatigue and the burn of the last 70, then 80, then 90 miles. Endurance events tend to bring out the quirks in people. The general weariness, the mile after mile of riding and getting beaten up by every bump in the pavement, the rhythmic spin of the pedals.... it's easy to space out, to lose your focus, or just lose your mind. About this time is when things start getting silly - we quote from random movies ("Nobody can eat 50 eggs! "), sing songs from our Scouting days (off key, of course), and generally try to ignore the pain as we press on to the finish line. The "endurance" part of an endurance ride is just as much mental and psychological as it is physical. The last 10 miles are some of the easiest - the finish line is getting closer, close enough to seem like an attainable goal. Dan's evil tire had so far held up, though the cantankerous wart was growing larger and angrier by the mile. The cycling gods were with us that day, and we made it back to town and saw the finish line looming ahead. We raised fists in the air as though we were winning a stage in the Tour de France and mugged for the photographers. I slapped the outstretched hands of family members waiting on the sidelines as we cruised to the arch and felt a little bit of glory as we finished the ride. We are not racers, we'll never win a professional bike race, but just finishing an event like this is a major accomplishment for most mortals. We made it through Hell's Gate and completed Century #1! Leaving now for Wichita Falls. No idea if there is wifi available so the next post may be after we return. Tomorrow we leave for the Hotter N Hell Hundred, the first of our 13 centuries. We will endure 100+ miles of cycling through blazing heat, driving Texas winds and baking concrete and we will love every minute of it.